The RV park is quiet, but the property is on a downward slope so most sites require some sort of leveling system. The long-term residents keep their sites clean except a couple of "Travelers" doing the annual asphalt "work". The washing machine, in the men's restroom, did not put enough water in the tub and when the wash was finished there were dry spots on the clothes...yuk. The dryers are clogged with lint so they did not dry well. Even though the park was kept clean, it's in need of a good maintenance plan and oversight because it seems rundown. The electrical connection did not have a circuit breaker...it was located on a mains box several sites away. For the money, next time I'll be staying across the street at the Trailer Ranch RV Resort which is beautiful and impeccably kept. We camped at Los Suenos de Santa Fe RV Park in a Travel Trailer. GREAT RV Park with lots of room between sites!!! Amenities include two dog parks, dog wash station, rally hall and barn, free shuttle rides to the casino and burger joint across the interstate. They have their own reverse osmosis plant for superior water. All the staff was accommodating, professional and friendly. 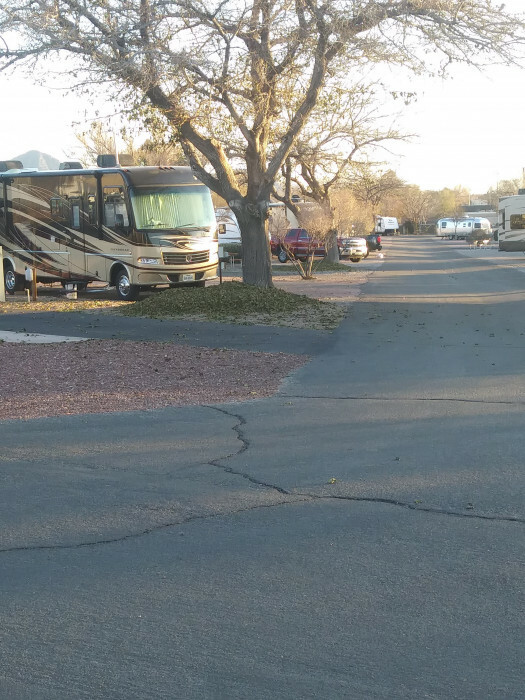 Even though I've rated this RV resort with top ratings, I do not recommend the few back-in sites that have grass because their in-ground irrigation system is in need of repairs which left the grassy areas wet and muddy. We camped at Route 66 RV Resort in a Travel Trailer. Nice park with LONG pull throughs. Nice spacing between sites. Laundry room was clean. Plenty of space to walk the dogs. The staff was very accommodating, friendly and helpful. The park is very central for anything you want to do in Wichita Falls. We camped at Wichita Falls RV Park in a Fifth Wheel. Good park for an overnight stay. Pros...fenced, long and well kept dog area, easy access, wide spaces for over-nighters, Surprisingly very little interstate noise, -friendly staff and quiet considering how many long-term residents are living at this RV park. Cons...as with all RV parks in this part of Texas,the RV sites are all gravel, very few over-night spots so make sure you get a reservation and it's not conducive to sit out to BBQ or have friends over for a get-together due to its crowded industrial feel. We camped at Midland RV Campground in a Travel Trailer. Good for an overnight stop and big rig friendly. Free breakfast in the morning is a nice touch. Sites are a mixture of gravel and grass and are packed down very well. There are no picnic tables or patios. They say they have over 200 big pull-thru sites, but most are occupied by long-term RVs. There seems to be enough upfront sites to fulfill the overnight demands. Plenty of room to walk the dogs, but there is no fenced-in area to let them run. We would stay here again if traveling and needed an overnight spot even though this park fast approaching needed road and site maintenance. We camped at I-35 RV Park in a Fifth Wheel. Magnolia Farms and the Texas Ranger Museum. Nice new park with ample space for big rigs. Digital TV channels was a nice touch. LOVE the dog park and ample green space in the middle of the park to walk the dogs. Some of the sites are not level, so be prepared to adjust your rig to raise the left side slightly or ask for a more level site. Sites are crushed granite. 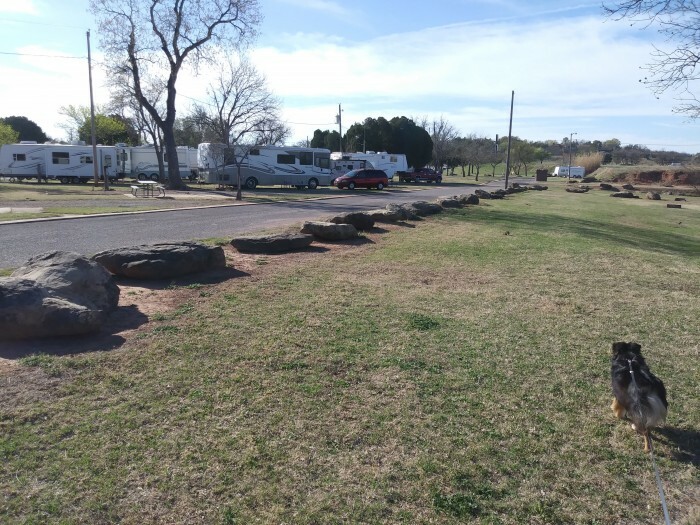 This is the best RV park in Fredericksburg. We camped at The Vineyard at Fredericksburg RV Park (formerly Quiet Creek RV Resort in a Fifth Wheel. Large level gravel sites. Maintenance personnel seemed to be driving by every 15 minutes, so the place was very clean. They smoke their own meats which you can it delivered to your rig (complete meal) during dinner hours. Nice play park for the kids and dog walk areas. We would stay here again. We camped at Carlsbad KOA in a Fifth Wheel. Nice quiet and clean park with friendly and helpful staff (owner). Like others have stated, level sites on gravel with a very small place for the picnic table and limited walk areas for the dogs. We would stay here again. We camped at Trailer Village RV Park in a Fifth Wheel. Obviously, if your in Roswell you have to look for aliens. Lots of places/stores to find them. Great RV park. Quiet, lots of space, clean, friendly, and a nice dog walk area--tell them you have dogs and they will put you near the dog pen and grass. Even the long-term residents are clean and neat. This is the park to stay at if your in Amarillo. We camped at Oasis RV Resort in a Fifth Wheel. Palo Duro Canyon is near by along with the Cadillac Ranch. A small clean RV park with easy in and out access. The main drive and pull-through sites have crushed granite and is big rig friendly. Plenty of room for the pets to walk. It a quite park with some train and traffic noise, but it did not bother us. The lots have plenty of room and grass. We enjoyed our visit and would stay here again. We camped at Ole Towne Cotton Gin RV Park in a Fifth Wheel. Super RV park...the best we've stayed at. Great staff, all areas were very clean, level sites, and outstanding laundry facility. There were staff working the grounds all the time. The best part was the city bus would pick us up right outside the gate and drop us off within a block of the Alamo and River Walk. If you're visiting San Antonio, this is the place to stay. We camped at San Antonio / Alamo KOA in a Motorhome. We were impressed with this RV park. It's off a major road, easy access, mature trees, level and very spacious sites with a gravel like pad, great cable, and good water pressure. 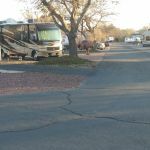 It was kept very clean and even with the long term residents, it was one of the quietest RV parks we've stayed at. We did not use any of the park's accessories (bathhouse, laundry, or pool), but park was very dog friendly (we travel to dog shows). The park staff were friendly and helpful. We will definitely stay here again. 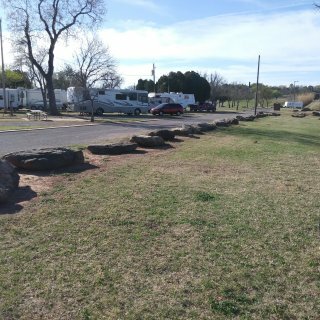 We camped at Texas RV Park of Big Spring in a Fifth Wheel. First, the one positive--the owner was friendly and helped us find a somewhat level site. All the level sites were taken by long-term residents, which seemed to occupy most of the park. Our site had a 3-foot drop from the rear of our 5th-wheel to the front. I saw some 5-wheels with their landing gear all the way to the ground while others used extreme means to get their rigs level. All roads and sites are packed sand with some grass. The park was kept clean, but there were dogs wondering around and some of the long-term workers were party animals on the weekend. There was Wi-Fi at the pavilion only. I would not have stayed here except it was the only RV park within a reasonable distance to visit our grand kids. I would not recommend this park to anyone with a large rig and don't try to come in at night because it's difficult to get around plus some sites are not marked very well. I guess everything is a matter of perspective because I mentioned to my neighbor (a long term resident construction worker) that this was the worst RV park I've stayed at and he stated it was one of the best he's stayed at. We camped at Arrowhead Campsites, Inc. in a Fifth Wheel. I was impressed with this RV Park. All the roads were paved and the sites had very nice concrete pads. The Wi-Fi was fast and the cable TV good. The Interstate noise did not bother me. There was a lot of space between sites and the mature trees made the RV park seem more like a state park. We camped at Parker's Landing RV Park in a Fifth Wheel.